I have been privileged to serve as a director for the Minnesota Chiefs of Police Association Board of Directors and on a number of the association's committees. My committee work includes the co-chair for the Executive Training Institute (ETI) Planning Committee, participation in the strategic planning committee, the Professional Development Committee, and the Legislative Committee. Additionally, I am an instructor for the CLEO and Command course. Through my work with the association, I have been privileged to contribute to a group of police professionals and first-class employees of the association to advance key policy initiatives and professional development during a time of unprecedented challenges for our membership. The key areas I am most proud of are: - Ensuring the highest quality training is provided at the annual ETI conference. - Introducing a legislative proposal to the legislative committee to increase funding from the Minnesota POST Board. - Building strong relationships with chiefs across the state to understand their needs. When first seeking election to the Board of Directors, I stated I believe my over two and a half decades of experience spanning a career beginning in the Chicago suburban area, to serving in rural Minnesota, and currently leading in the Twin Cities area has prepared me for the responsibilities of the Board of Directors. 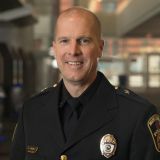 My diverse experience has given me an in-depth understanding of policing issues and concerns specifically in out-state Minnesota, the Metro area, and suburban policing in general. I understand and value teamwork, the value of including diverse and innovative ideas, and reaching solutions to meet the needs of many constituents. Finally, I am committed to high standards and passionate about a profession I am blessed to be a part of. Since then, I have proven myself as a committed, involved, and effective leader in our association. Through my proven track record with the association complimented by nearly three decades in the policing profession, I know I am prepared to meet the responsibilities and challenges of the 3rd Vice - President position. Overall, my first priority is to support the MCPA Board of Directors and Executive Director in implementing the association's Tactical Action Plan. My specific priorities of interest include: - The association's branding efforts in general and specifically to assist the membership with their recruiting efforts. - Continue the highest levels of training at ETI and throughout the year, while furthering electronic accessibility of training. - Ensure the membership understands and makes the best use of additional training funds from the Minnesota POST Board. - Ongoing development of peer connection between chiefs throughout Minnesota. The election for MCPA's 2018-19 Board of Directors will take place at ETI on Tuesday, April 24th at 9:00 a.m. in the Lake Superior Ballroom immediately following the presentation on Fair and Impartial Policing.